The popularity of TV shows such as The Killing and Borgen, along with the novel and the movie of The Girl With The Dragon Tattoo, have led to a revival of interest in Scandinavian-style interior design. Of course, you could argue it never really went away, with the continuing popularity of a certain chain of flat pack furniture outlets, but right now the Scandinavian aesthetic, one of clean lines and cool, contemplative colours is more popular than ever. 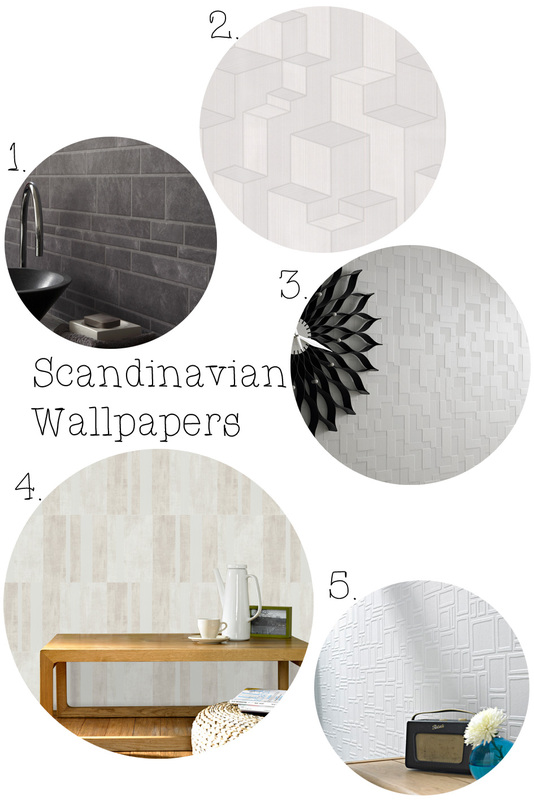 We’ve chosen five designs from our collection that we believe will go towards giving your home that chic, Scandinavian feel. A great choice for bathrooms or kitchens, ‘Slate’ mimics the cool, crisp effect of grey slate for a look that’s modern and minimalist without skimping on style. The horizontal striping of the slate pattern is perfect for creating the illusion of more space in smaller rooms. It's also an excellent example of understated Scandinavian design simplicity. Somewhat reminiscent of the mind-bending “upside-down staircase” drawings of M.C. Escher, ‘Tower’ features an optical illusion pattern of interlocking geometric shapes in shades of pale grey and white. This design comes in other, bolder colours, but we believe this version is the most glacial and Scandinavian; another excellent selection for kitchens and bathrooms alike. Textured and tonal, yet plain enough to meet Scandinavian wallpaper tastes, ‘Checker’ provides a 1960s retro-style wallpaper with a contemporary twist, while its layered finish will create a subtle, shifting effect throughout the day. This design is the perfect background contemporary or vintage retro furniture, whether you’re using it in the sitting room, dining room or bedroom. You could even use this to highlight a single feature wall alongside a single colour, non-patterned wallpaper. Other variations of the ‘Damier’ design use a bolder contrast of light and shade, but this version’s light greys and whites are a little more understated; cool but not cold. This minimalist design in subtle tones brings to mind the abstract paintings of artists such as Mark Rothko and Jasper Johns, but with a crisp, Scandinavian edge. An excellent wallpaper for any room that receives a lot of natural light throughout the day. Another modern Scandinavian-style wallpaper that’s great for catching subtle hints of light and shade during the day, ‘Large Squares’ showcases a pattern of loosely rippled squares and rectangles in different sizes for a modern, minimalist look. In crisp, clean white this makes an excellent addition to bathrooms and kitchens, but if you’re feeling creative you could try painting it the colour (or colours) of your choice.